XENIA — Fifty years ago, 262 students made history when they walked through the doors of Greene Vocational School on West Enon Road. 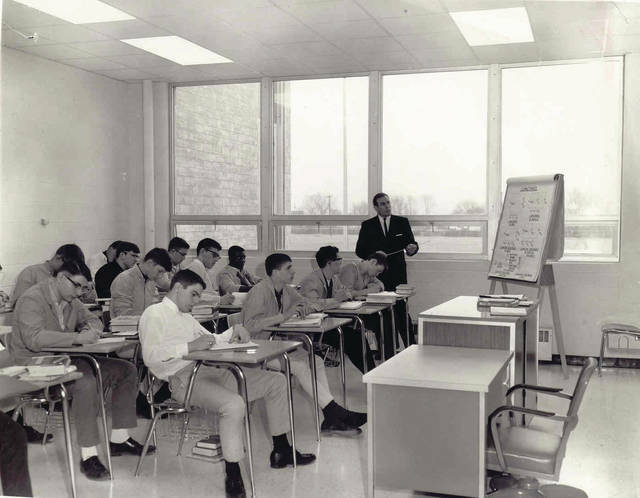 In its first year of operation in 1967, highschoolers from around the county attended vocational classes in the south wing of the building. They chose from 19 programs in addition to one academic class, English for juniors and social studies for seniors, and ate lunch in the auto body lab. They were merely the first of thousands to attend the school now known as the Greene County Career Center (GCCC). But before the first class of students entered the school, a small group of people had an idea, or rather — a dream. Greene County school district officials began the discussion in June of 1961. They wanted to create a school where students could have access to career training. Three years later, the Greene County Joint Vocational School District was formed, including Greeneview, Sugarcreek, Beavercreek, Cedar Cliff, Xenia and Fairborn. Eugene Kavanagh was soon hired as the school’s first superintendent and Wallace Gossett was named director. Forty-year-old Gossett was the coordinator of the diversified cooperative training at McClain High School in Greenfield when he was called for an interview and later hired. He brought his vocational education expertise with him to Greene County, but quickly learned there was much more work to do before the school could open. Architects began initial drawings for the first building that same year and a bond issue and operating levy were placed on the November ballot. “I was going around to Lions Clubs and ladies’ clubs and so on, promoting the vocational school … [There] wasn’t anybody else to do it so I had to do it,” Gossett, now 93, said. Both failed that fall, and again in 1965. “Those times when it failed, I didn’t know if I had a job or not,” Gossett said. Two levy issues appeared on the May ballot in 1966, and passed. Gossett remembered breaking ground on the 40 acres of donated land and helping the architects design the building. “When they were building the building it was real muddy, and when they brought the cement trucks in to pour the cement in the forms for the foundation, they had to push them in with bulldozers to get them back through the mud … We got ‘er right in and we started in ‘67,” he said. Gossett designed the building to have plenty of space for classrooms and labs. He interviewed teachers for each vocational area, sometimes narrowing it down from 20 candidates to one, another time pleading with an auto mechanic to come teach at his school. The first year saw a sit-in, the firing of academic teachers and the hiring of new teachers in the middle of the year. Gossett remembered other students who at first struggled and then turned around to excel in their areas and lead their classmates. He also recalled driving big buses full of students to other schools for contests in their trade areas. “Like automechanics would fix an engine, something [that was] wrong with it … they’d come in from the different schools and they’d try to fix it,” he said. Gossett also secured all of the equipment for the school. This included lifts for auto-mechanics, saws for carpentry and lathes for machine trades. Gossett found drafting tables, printing presses, cosmetology materials, nursing assistant equipment and even materials for the cafeteria, he said, naming them off one by one as if it were yesterday. The school’s first director didn’t just secure material items for the school, though, he also transformed education for his students. “Now back in those days, vocational agriculture was designed for boys going back to their home farm. The vocational end of it — we wanted to have agricultural mechanics. That meant repairing tractors, working in dealerships and things like that,” Gossett said. The Greene Room still operates today. “I tried to keep everything like it would be out in the industry,” Gossett said, explaining that his food service students cooked for their classmates and the auto mechanic students worked on teachers’ cars. According to Gossett, the Greene Vocational School was the third vocational school to open in the state. Gossett is turning 94 on Friday, Sept. 15, and he’s still thinking about the students that graduated during the early days of GCCC. When asked what he thought they’d reply, he considered it for a moment, and then answered. Submitted photos This artist’s rendering of the Greene Vocational School was used during its early design and construction phases. 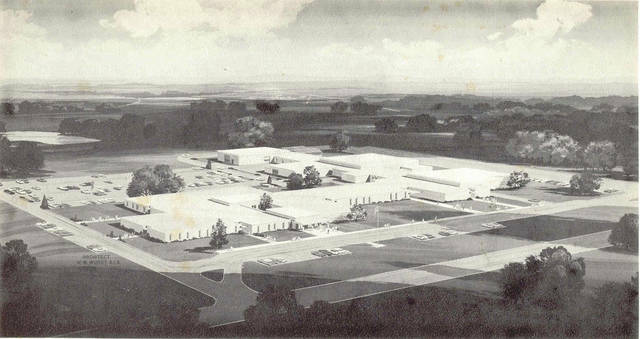 https://www.fairborndailyherald.com/wp-content/uploads/sites/50/2017/09/web1_aerial-artist-rendering-cmyk.jpgSubmitted photos This artist’s rendering of the Greene Vocational School was used during its early design and construction phases. This photo of a class of male students dates back to the early years of the vocational school. https://www.fairborndailyherald.com/wp-content/uploads/sites/50/2017/09/web1_classroom-shot-cmyk.jpgThis photo of a class of male students dates back to the early years of the vocational school. One Greene Vocational School student types on an electric typewriter during class. https://www.fairborndailyherald.com/wp-content/uploads/sites/50/2017/09/web1_classroom-shot-cmyk.jpgOne Greene Vocational School student types on an electric typewriter during class. Editor’s note: this is the first story of a series celebrating GCCC’s 50th anniversary.